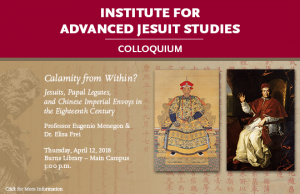 On April 12, the Institute for Advanced Jesuit Studies presents a scholarly colloquium on the Chinese Rites Controversy. Hosted in collaboration with Burns Library of Boston College, the colloquium features presentations by Elisa Frei and Eugenio Menegon. Details are available online. Frei, a fellow at the Institute, and Menegon, a collaborative scholar at the Institute and an associate professor of history at Boston University, will speak about the lives of some Jesuits of the China mission who traveled across the oceans, cared deeply about the issues, took sides, played politics, and suffered dire consequences for doing so. The experiences of these missionaries represent a microcosm of the controversy and reveal its global reach as a clash of cultures and a unique phenomenon in early modern intellectual and religious history. “Calamity from Within? : Jesuits, Papal Legates, and Chinese Imperial Envoys in the Eighteenth Century” begins at 3pm on April 12 at the Burns Library on the main campus of Boston College. Attendees will also have a chance to review an exhibit of selected books from Burns Library’s Jesuitica collection that are related to the controversy. The event is free and open to the public. To RSVP, please visit this website.